Fr. 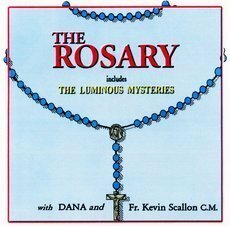 Kevin Scallon, C.M., leads us in prayer and meditation and Dana, in her song, captures the very essence of how to pray the Rosary. She sings "help us to know your son, Jesus true God and true man". As we pray this rosary, we walk hand in hand with Mary who shows us the way to Jesus. This 2 disc set includes the Joyful, Luminous, Sorrowful and Glorious Mysteries.